One way to find the area of a regular hexagon is by first dividing it into equilateral triangles. You also need to use an apothem — a segment that joins a regular polygon’s center to the midpoint of any side and that is perpendicular to that side. First, sketch the hexagon with its three diagonals, creating six equilateral triangles. Then draw in an apothem, which goes from the center to the midpoint of a side. 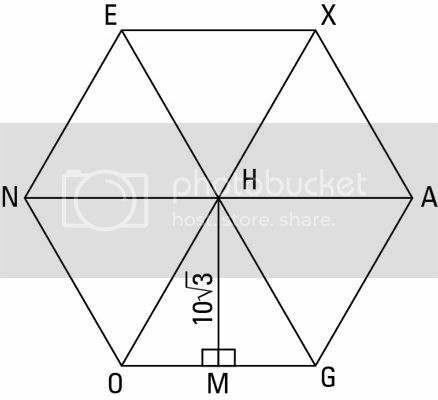 The following figure shows hexagon EXAGON with its diagonals and an apothem. يقول المولى عزَّ وجلَّ:" يَا أَيُّهَا الَّذِينَ آمَنُوا ارْكَعُوا وَاسْجُدُوا وَاعْبُدُوا رَبَّكُمْ وَافْعَلُوا الْخَيْرَ لَعَلَّكُمْ تُفْلِحُونَ"
طريقتك وتقسيم السداسي إلى مثلثات. ولغتناء عربيه والقرأن عربي ياعزيزي الجازي القديره. أهـم شي لقيت الحل ..
اختبار استثنائي لسد العجز في معلمي الرياضيات والإنجليزية ..